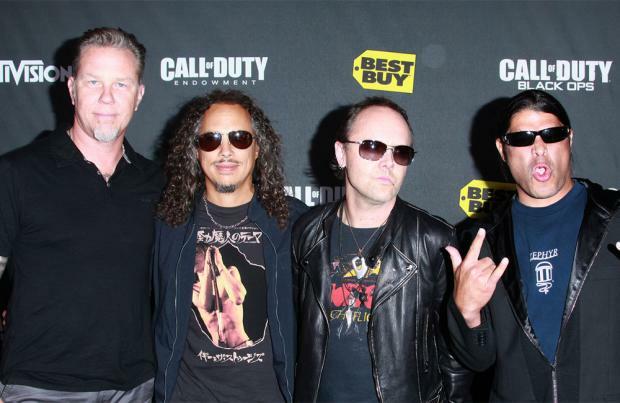 Metallica's next album should be released later this year. The popular group have not released an album since 2008, when they produced 'Death Magnetic', but drummer Lars Ulrich has revealed the next album is "pretty close" to being finished. He told Vulture: "There's a record coming at some point, in the future. Not soon enough, but we are pretty close. "Unless something drastic happens, it will come out this year. We should be done with it this spring." Lars admitted the album still does not have a title, although he revealed a series of songs have already been recorded and the creative process is already in full swing. He said: "I don't know what else to say - there's no title yet, there's a bunch of songs, it sounds like Metallica, it's all good!" Meanwhile, the band's drummer recently confessed he cannot fathom how the band made their third studio LP 'Master of Puppets' in just eight weeks. The 52-year-old star said: "There's a spark or spontaneity or impulsiveness that happens when you're in your twenties. We wrote 'Master of Puppets' in probably eight weeks over that summer. "Nowadays, it takes me eight weeks just to drive own to the studio. It's like, 'What the f**k did we do in the summer of '85 where we could just give birth to that from the first note to the last note in eight weeks?'"